The Rifacli fans are handmade by the same recipe for more than a century. Each fan is handmade, which makes each one has a unique character. 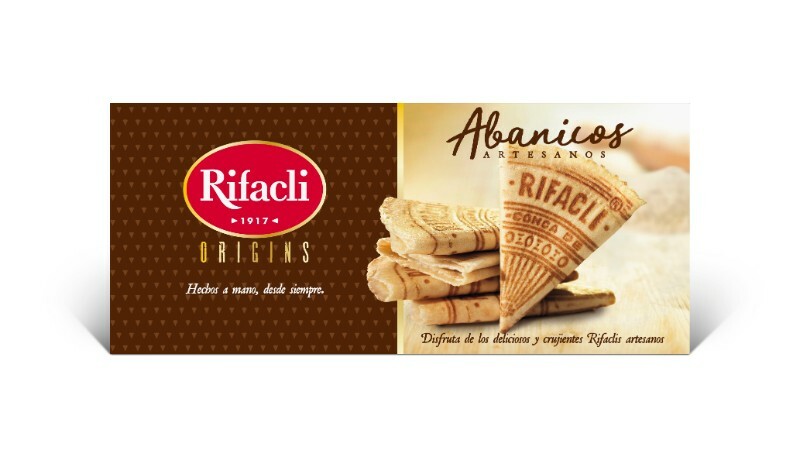 Artisanal fans, together with Carquinyolis, are the first cookies created by Rifacli in 1917. Accompany your dessert with a delicious fan and give it a unique personality. Ingredients: Wheat flour, sugar, palm vegetable oil, coconut and sunflower vegetable oil, powdered egg, colouring: E-150 (d), soy lecithin, salt, gasifying: E-503ii, vanillin and flavourings. Fans covered in a delicious layer of cocoa. They are delicious eaten alone and also accompanied by coffee. Vanilla fans, ideal for decorating a composition of ice cream balls.